Philadelphia-born iNFiNiEN combines eclectic musical personalities into a visionary, unified force. Using rock, jazz, soul...,world, and classical influences, the quartet plays intricately composed songs with a focus on improvisation. Far from the typical rock band, they explore new territories of sound by using exotic scales, chords, and rhythms. iNFiNiEN's repertoire is like a living organism in that our members continuously find new influences in their living and playing experiences. The new album “Light At The Endless Tunnel” counts eleven tracks. The opener “Brand New” is one of the three tracks that includes a real chamber orchestra. The opening has a jazzy atmosphere and keyboardist and singer Chrissie Loftus is making quite an impression with her flawless vocals. Halfway the track the chamber orchestra is taking the music to an even higher level. Beautiful string and flute melodies support the music. I am impressed by this beautiful opener! In “Aya” the jazzy rhythms are combined with melodic keyboard lines. Halfway the track becomes up-tempo and all kinds of rhythms and eastern melodies are used. Great drumming of Tom Cullen and freaky King Crimson like guitar parts of Matt Hollenberg. In the beautiful and short “Oasis” the leading role is for singer Chrissie Loftus. She wrote both the music and lyrics. As reviewer I am searching for references, but the music is so original. Yes we are listening to real progressive music. In “Off The Tracks” the band gives full throttle. Complex rhythms, amazing drum parts and hectic guitar and keyboard solo's are interspersed with impressive vocal lines. in this track the tension of the music is working towards a climax. The contrast with the opening of the next track “Bottom Of The Food Chain” is high. The track is written by bassist Jordan Berger and singer Chrissie Loftus. You can enjoy lovely bass lines and great vocal melodies. Towards the end the music becomes more complex. Then it is time for the title track “Light At The Endless Tunnel”. The track has an up-tempo opening with frantic bass lines. The band uses all kinds of musical influences and instruments in this diverse track. I hear for instance Indian influenced vocal parts. Some of the complex vocal parts are hard to follow. This kind of complex music can only be played by highly skilled musicians, very impressive. Luckily the band is slowing down with the next track “Love For Yourself”. Delicate guitar and piano parts support the beautiful vocal melodies. Chrissie Loftus is an amazing singer. Then two short tracks of Chrissie are following. The first one is entitled “Worth The Wait” and has beautiful piano parts and lovely flute melodies. The second one “If I Were A Song” is the companion of the next track “If You Were A Song”. We can enjoy the chamber orchestra on both tracks.“ If I Were A Song” is sweet classical piece with delicate sung vocals. It goes seamlessly into the jazzy opening of “If You Were A Song”. It is a beautiful and uplifting song that slowly develops into a progressive piece of music with some great guitar solo's, lovely bass lines and catchy vocal melodies. The last track “Existence” has a delicious Jaco (Pastorius) like bass line. This short up-tempo track with some African rhythms is a worthy ending of an amazing album. 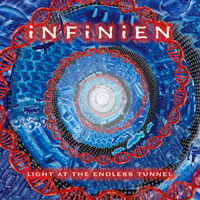 iNFiNiEN impressed me with this wonderful “Light At The Endless Tunnel” album. The band consists out of highly skilled musicians/composers and has with Chrissie Loftus an amazing singer on board. Besides jazz and classical influences the music of the band is a real melting pot of musical styles. All those different styles are integrated into their own original music. This gem is a real progressive album for the open-minded music lover and therefore highly recommended by progVisions!